Our CrossFit Aevitas family is full of the most amazing people! This Aevitas Athlete Spotlight segment is all about Christina Chiappetta (aka: CHIA!). If you don't know Chia yet, this should give you a peek into who she is, and why we decided to spotlight her! If you do know Chia already, keep reading - you might learn something that you didn't know before! Chia: I grew up in a large town called Monroe in Orange County, New York. I currently live in Albany and have for about 8 years. My parents, Michelle and Aldo, still live in my childhood home. My older sister, Nicole, and younger brother, Aldo, live close to where we grew up…of course making me the rebellious middle child. I also have an incredible fiancé name Kelly. Together, she and I are a dream team-we crush getting chores done around the house and equally love to be outside. This makes going on adventures (hiking, travelling, bike riding 20 miles to the Altamont Winery in 100-degree heat after a long night out) way more fun! We are both early birds and love our routines which makes getting up to go to the gym way more doable. No wedding date set yet, but we are enjoying engagement with a bit of house hunting! I work for the Albany County Water Purification District (previously known as the Sewer District) as the Permit Compliance Technician. My position is heavily environmental as I, along with my boss, ensure that our facilities comply with multiple water and air quality regulations. I truly enjoy my job and love being part of fundamental environmental work. It is this kind of bottom-up work that really makes an environmental difference. Wooo. Q: What was your experience level with athletics prior to CrossFit? C: Prior to CrossFit, I was mainly working out at Best Fitness with a small group of my rugby friends. We all brought different exercises/routines to the group so we could adequately prepare for our season-weightlifting, bodyweight movements specific to rugby, and ‘traditional’ cardio. I have been playing rugby for about 12 years, so a lot of the training I have done has been to become a better player. Half marathons, tough mudders, and hip-hop classes don’t really fit that bill, but I like to have a variety of activities. Q: How long have you been doing CrossFit? C: I have been doing CrossFit for 3.5 years, all at Aevitas. 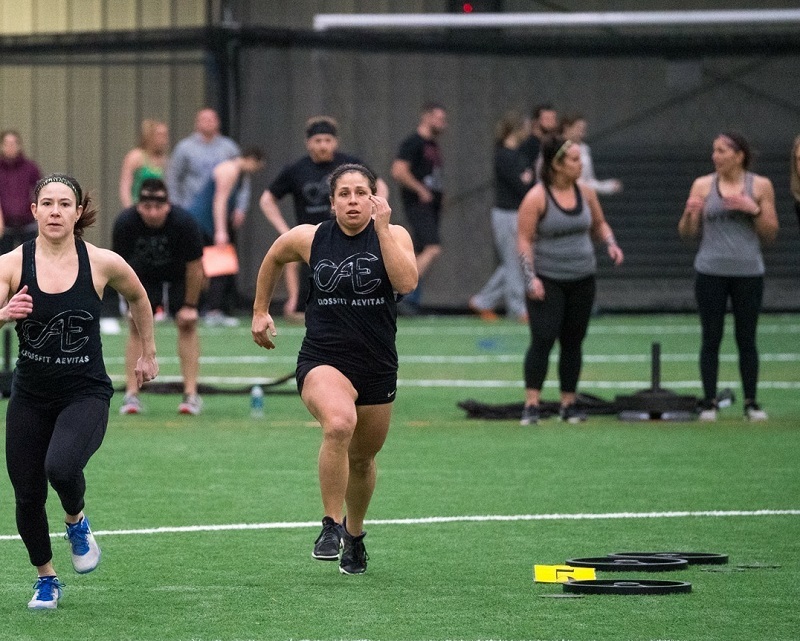 When I first started, the 5:30AM class was just a bunch of crazy rugby players and it has transformed into a jam-packed class full of some of the best, most hard-working people I know. Q: What is your favorite thing about CrossFit and CrossFit Aevitas? C: My favorite thing about CrossFit is working out with friends. I am very used to training in a team setting so that is something that works well for me. As far as Aevitas, I really enjoy being with such a mix of people with different levels of experience and skill. It is fun being around such an eclectic group! Q: Favorite CrossFit movement and why? C: My favorite Crossfit movement is the box jump. I like how methodical it is-you can set a really great pace for these and roll through them. Q: Least favorite CrossFit movement and why? 3) burpee to a target-probably one of the most mentally challenging movements especially when doing them for 8 minutes…grumble. Q: Most memorable WOD/workout and why? C: I think it was the CrossFit open workout 15.5 (burpees and thrusters?). It was the first workout I did Rx after my ACL reconstruction surgery. I remember just being so happy that I could do it and that I finished; it showed me that I was progressing and that I might not have been where I was before my injury, but I was getting there. Q: In what areas have you improved the most since you began doing CrossFit? C: Most of my improvements have been in the gymnastic realm of CrossFit- pull ups, T2B, double unders, HSPU, etc. Pull-ups, never mind chest-to-bars, were very unattainable previously. Q: What are some of your interests and hobbies outside of CrossFit? C: Rugby is most of my life. I am the President of the Albany Knickerbocker Rugby Club and it absorbs a lot of my time, but I totally welcome that. I love my Club and all the people I work/play/celebrate with. Most of my closest friends are rugby players and I consider them all my wacky, dysfunctional family. Another big part of my life is my garden. I start a majority of my plants from seed and share a couple community plots at the Hartman Garden with a pal of mine that some of you know, the one and only, Willow. I really enjoy travelling, particularly to places that are off the beaten path. One of my most memorable trips was when I went to Morocco for 3 weeks on what ended up being a largely solo journey. The desert, the markets, the people, the FRENCH PASTRIES. It was amazing and certainly a place I’d go back to. Q: Describe your happy place….imaginary or real. C: My happy place is being knee deep in some body of water looking for bugs and fish. You might see me in the Normanskill doing exactly this over the springs and summers. Q: Last one: What famous person would you most like to sit down for a meal with and why? C: After throwing a bunch of names in a hat (including Obama, Dr. William Beebe, Toni Morrison, Chef Marcus Samuelson, Dr. Seuss, and a few others), I picked Charles Darwin. Of course this comes across as super cliche since I am a biologist choosing one of the most influential scientists EVER to sit down with, but there is a lot to consider: Darwin came to the science community and defied the norm, he fought for his beliefs, and he was enthusiastic about his research. And, we are eating a roasted chicken with eggs...get it? Thanks for taking the time to answer our questions, Chia! Athletes - keep an eye out for your turn to be in the Aevitas Athlete Spotlight! All questions on Aevitas Athlete Spotlight questionnaires are 100% voluntary. Aevitas Athlete Spotlight - Andrew!